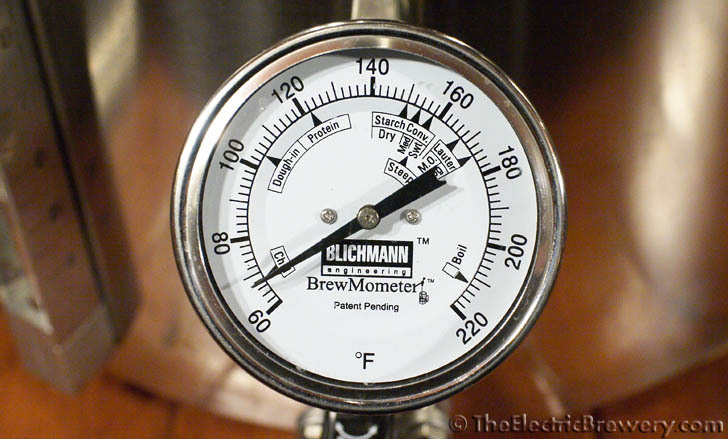 Blichmann BoilerMaker kettles come equipped with good analog bimetal thermometers (they call them BrewMometers) that are adjustable so that you don't have to stoop to read them like you do with most kettle thermometers. 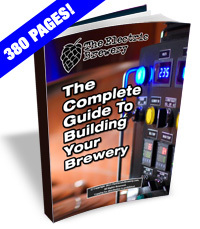 They are custom made for brewing and various labels show the temperature ranges used in brewing. BrewMometers are also available for sale separately. In our all electric setup we don't use these thermometers as all temperature measurements and control are done from our control panel. These thermometers simply serve as a backup as the kettles are, unfortunately, not available without thermometers. 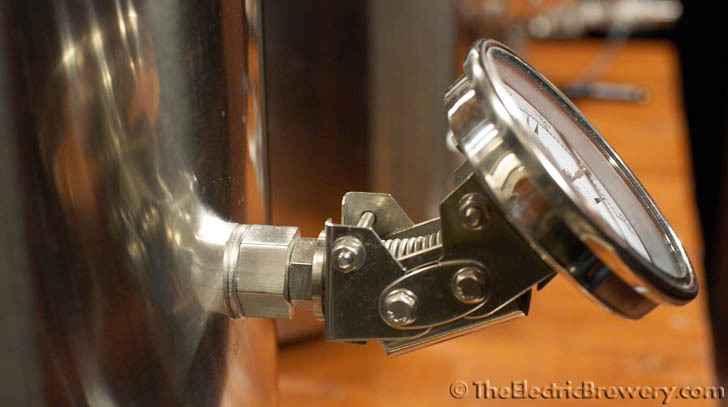 If you do find that the BrewMometer gets in the way, you can remove them and fill the hole with a Blichmann BrewMometer hole plug (see picture at right). This plug was originally meant for those who used their kettles to make different sized batches of beer and may require multiples holes for the BrewMometer to accommodate different volumes. (Blichmann purposely places the BrewMometer fairly high up on the kettle to avoid heat from propane and natural gas burners - not an issue for us in our Electric Brewery). We don't find that the BrewMometers get in the way so we leave them in place. As mentioned previously, they also provide a convenient backup temperature reading.